Being an absolute morning person I like to rise at 5 a.m. or sometimes earlier. Every day after the divorce, I would get out of bed, thanking God for the new day. The first thing I would do was walk to the table next to my favorite overstuffed chair in the living room and light a single white taper candle, a tradition that began with Father A’s gratitude exercise. My time in the morning solitude increased after returning from the women’s monastery. In Greek Orthodoxy lighting candles represents Christ as the light. Every morning after I light the candle, I go make my latte. I look across the dark quiet living room from the kitchen at the flickering flame and I feel it’s God beckoning me to come and spend time together. A latte is an important part of my morning ritual. For as long as I can remember I have had a spectacular espresso machine. I justified the exorbitant cost by telling myself I am saving the daily cost of a Starbuck’s. During my marriage to FP every morning he would make me a strong two or three shot latte with frothing low fat milk, just the way I like it, and bring it to me. He liked to get up early and go to the gym, and even when he left earlier than I got up, he would put the latte on the nightstand for me as he left. It didn’t matter if things were going well in our lives or if there was tension between us, I always had the steamy latte waiting. FP had difficulty expressing himself and wasn’t one with romantic words. I realized that by presenting me with this latte each morning, he was speaking his heart as best he could. It has become a ritual each time I have dinner with my former stepson, Peter, to remind him about this wonderful gesture that his father did for me during our marriage. When I do he always smiles. Now, I take the time to do it for myself. When my adult children are home I will make one for them as well. It has taught me an important lesson, that one of the things I miss most in my marriage was something so seemingly small. 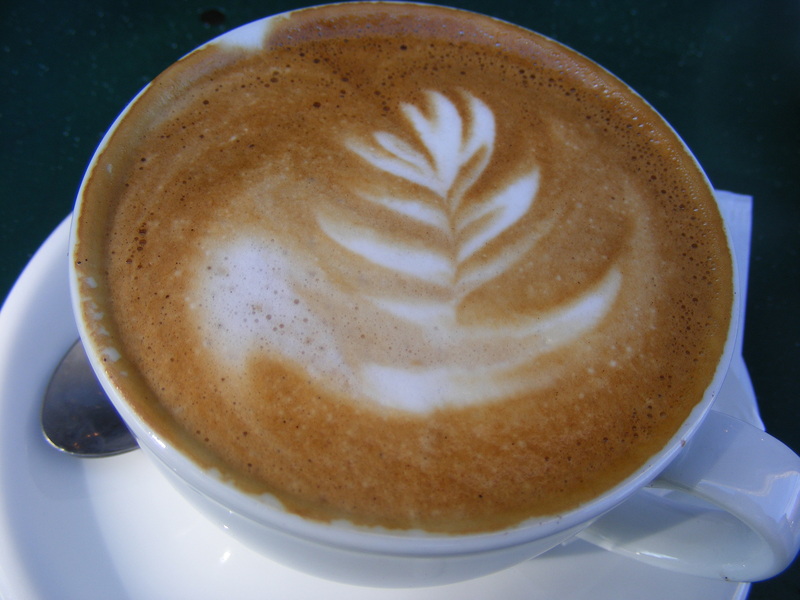 As soon as the espresso and steamed milk is ready, I take my latte over and sit in the chair. For a moment I’ll look at the foam, feel the warmth in my hands, and anchor myself in a mindfulness exercise. Whenever I go out for a latte I still stare at it to remind myself to be “in the moment”. Sipping my latte next to my candle in complete silence is the most incredible way to start the day. It helps me keep focused on how I want to spend my morning, away from technology, away from the worries of the world. I try hard to have the discipline that I won’t look at email, social media, my phone or the internet until I am fully dressed and on the way out the door to work. It is the piece of solitude I carried away from the women’s monastery in Safford. When I have quiet in my morning, my day automatically goes better. Once settled, in addition to my gratitude exercise, I write out my prayers to God. Because I love to write I find that I am better able to express myself to Him through the written word. I have taken classes suggesting a structure to this process but for me I simply “pour out” whatever comes, in whatever manner it presents itself, without being limited to a particular format. I figure God knows how crazily I am wired because He particularly made me that way. So I just converse with Him in the written word until I feel I have uncovered everything on my heart. Some days there are pages and pages and other days there is only a snippet. Each day I also try to write out a special prayer for someone who I mediated for the previous day. In the book Praying for Strangers by River Jordan, the author wrote about a new year’s resolution she developed in 2008, the year her two sons went to war. She decided to make a conscious effort to find one particular stranger in her path to pray for each day. In response to her example, I try to keep my heart vigilant in mediation looking each day for spiritual direction on which person or family has issues that weigh particularly heavily on my heart. I write out a prayer for them during my morning quiet time. I remember one case in which the husband had put surveillance on the wife and had tracked her to motels and other clandestine rendezvous with a man who he had identified was a mutual friend, also married. During the mediation the information he had was discussed in my private caucus with him and his attorney. When I met with the wife and her attorney privately, the wife denied everything despite the overwhelming evidence. Iowa has “no fault” divorce so this information did not obstruct our ability to settle the divorce. But the pain of the circumstances was palpable in the mediation rooms. At the conclusion of the mediation, while obtaining signatures on the final document in the private room with the wife, she looked up at me out of the blue and said “I am looking at my life and wondering how it got to this place. I need to get back to church and back to God and try to straighten my life out”. I responded to her, “I understand. In my morning quiet time I pray for people in my mediations. I would like to pray for you during that time. Would that be ok?” She stood up from her chair and hugged me. “Thank you”. I have had this quiet time for years now. I had more of a “relationship on the run” with God prior to the divorce. Now it is focused and gets richer every day. Even when I am on business travel I try to sustain the practice. On the rare occasions that I miss it, or have to short -circuit it, my day seems less peaceful and the rhythm less smooth. “Where would you have me go? Every day I feel like I am serving on a specific mission. Every day I feel the work I do is a divine appointment. Every person’s path I cross is for me, not coincidence. I am awake and alive and full of joy and peace. I would never have been this energized in my work or my life if I had not been flat-lined by a lost love and a painful divorce. I would have still been letting my life drive me instead of moving my life forward deliberately. In my gratitude list, I now add my heartbreak and divorce. Being “broken open” released my true life. Kim, if just one person finds grace your work is fulfilled.